WASHINGTON (Reuters) - The chairman of the U.S. House of Representatives Armed Services Committee strongly criticized President Donald Trump's plans for a new "Space Force" on Monday, setting the stage for a battle over one of Trump's favorite initiatives. Trump signed a directive in February to start the process of creating a new branch of the military dedicated to handling threats in space, which has become an applause line at the Republican president's campaign rallies. Legislation to create the branch requires congressional approval. 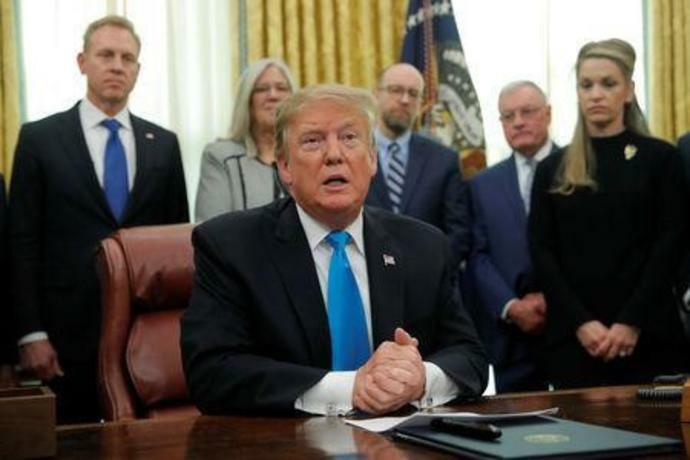 Proponents of Trump's plan have said it would make the Pentagon more efficient and lead to real reform of a national security area where the United States faces threats from Russia and China. But Adam Smith, the Armed Services panel's Democratic chairman, said Trump's proposal would create a "top-heavy bureaucracy," including two new four-star generals and a new Air Force undersecretary. He also said it requested "an almost unlimited" seven-year funding transfer authority that seeks to change existing laws without a detailed plan or analysis. "I hoped that President Trump and DoD (Department of Defense) would exercise careful consideration and develop a realistic path forward," Smith said in a statement. "However, the details of the Space Force proposal sent to Congress by the president are highly problematic." Smith said he would look at other potential legislative options regarding the Space Force. Representatives for the Department of Defense did not immediately respond to a request for comment.